Multiple Protocols: The user gets a lot of option for protocols. The service comes with OpenVPN, IPSec, IKEv2 over IPSec, L2tp over IPSec and PPTP protocols. The availability of multiple ports along with these protocols serves the user with a plethora of options. Strong Encryption: The data is secured with 256-bit encryption, and it is the most secure encryption available. So, the users should have no worries in this department. Double Hop: It is a multi VPN feature available on the service. 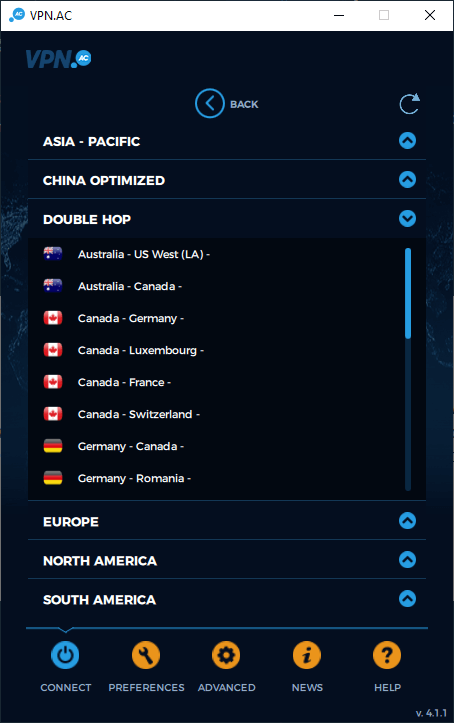 The user can choose from one of the available double VPN server connections. These double VPN server connections increase the safety of the VPN by two times. China Optimized Servers: There are dedicated servers for the users living in China and other VPN restrictive countries. The users living in such countries can connect to one of these servers and bypass the firewalls installed in the region. DNS Leak Protection: They have their own DNS servers, and no third party is involved. And on top of that they generate a lot of random DNS queries and flood them with the original DNS queries of the customers so that it is impossible for a third party to wiretap their DNS resolvers. Internet Kill Switch: It is one of the common but very important feature of the VPN services these days. An internet kill switch will automatically stop all the internet traffic if the VPN connection drops so that none of the user’s data reaches on the internet without the safety of the VPN. Responsive Customer Support: Even though they don’t have a live chat facility, the customer support system is quick and efficient. You can expect swift and concise answers from the service. Logging: The service is not a 100% no-logs service. Some of the information such as IP address of the user, time stamps, volume usage etc. are stored for at least one day. No IPv6 Support: The service does not support IPv6, and this can always lead to IP leak. However, the option to disable IPv6 on the device is turned on by default on the client. No Server Sorting: Even though the service has few dedicated servers for P2P file sharing, they have not created a separate server category for it. They have not included any dedicated servers for streaming as well. VPN.ac is a product from Netsec Interactive Solutions SRL, which is based in the southeastern European country of Romania. The product seems to have all the essentials ingredients required for a good VPN service. The protocols and the encryption available on the service are comparable with the major VPN services out there. They also claim to have additional security features on the service which make it stand out from the rest of the VPN crowd. If we are to believe their words, then this is also a very fast service. There is also mention of some exciting features such as double-hop and China optimized servers. It will be interesting to see how much functionality these features add to the product. By the end of this review, you will be able to make better judgement about the performance and reliability of the product, and you will also have a bit more knowledge about some of the general aspects of a VPN which can make or break a deal for a potential customer. This is the double VPN feature of the product. The feature is not new at all, and many VPN services provide such features under different names and attributes. What it does is that it allows the user to direct his/her traffic through two of the VPN servers. 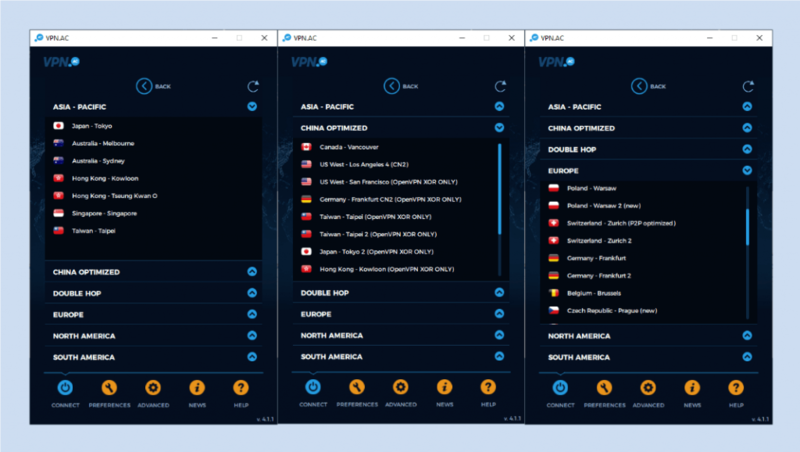 However, the user cannot choose any two VPN servers of choice, but has to pick one of the already available VPN server combinations. But the advantage of these custom combinations is that since they have been chosen by the VPN provider, they should be the most apt servers for such a connection and the user can better performance form these combinations. The actual advantage of a double hop is that it doubles up all the security aspects of a VPN service. One obvious downgrade is in the speed since there are additional encryption and decryptions involved. We obtained 56% of the original speed on the Canada-Germany multihop server, and the considering the fact that the traffic is being routed through two VPN servers, the speed is satisfactory. The servers constitute the network of the VPN service, and there can be no better parameter than these serves to judge a VPN network. But it is not only the number of servers or the number of server locations that have a direct relation with the better performance of a VPN service. You also need to consider the bandwidth available on each server, how scattered away the server locations are, how many dedicated servers are there, if the servers support IPv6 or not, and a lot of other such factors. VPN.ac has servers in more than 20 countries at the time of this review. These servers countries are in Asia-Pacific region, the American continents, and Europe. Majority of the servers are in Europe and America. The users in the Asia Pacific countries can also expect some of the servers close by. But the users in the rest of the regions should not expect any servers in the proximity. The closeness with the server has an important role to play in the speed after the connection is established. The list of servers contains a few China optimized servers as well. These servers are for the people living in China or in other such countries where VPN is restricted. Sadly (and happily as well), we were not able to test the functionality of these servers as we don’t have any acquaintances in any such countries. But theoretically, the service should be able to bypass the firewalls such as ‘The great firewall of China’ and obfuscate the VPN traffic as normal internet traffic. The list of servers also contains P2P optimized servers. But there is no option to list out these optimized servers separately, and the user needs to find them in the list of the servers for various regions. The server sorting in the client is only region specific, and the need for better sorting options is always felt while using the service. In addition to the P2P servers, they could have also added some dedicated streaming and gaming server for the users. 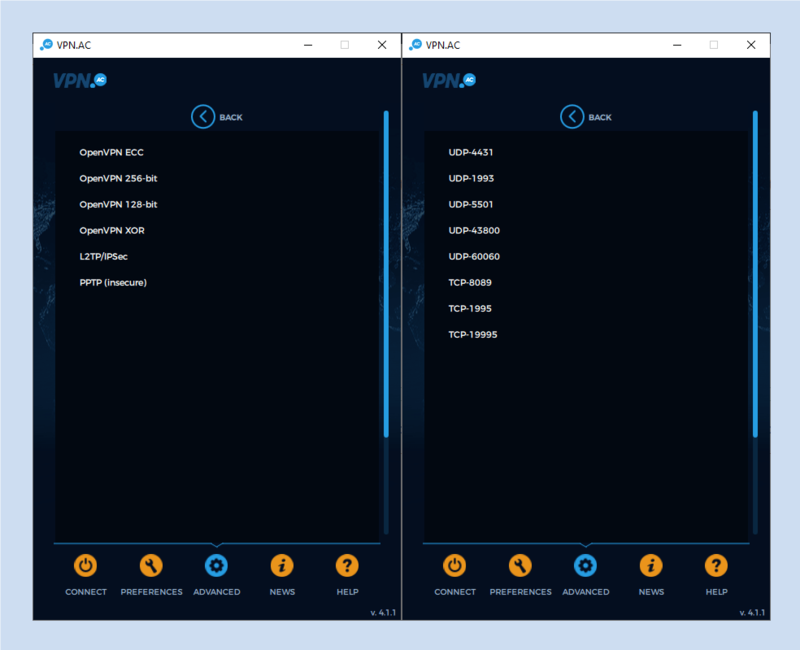 Such options make the users choose the optimum servers for their desired tasks, and the VPN service is also more likely to perform better under such conditions. The automatic server selection option is also not available on the client. The user needs to have manually find and then connect to the closest available server. Addition of the smart-connect or automatic -connect option would have eliminated all these steps. It is also worth mentioning that the service uses its own DNS servers, and there is no third party involved. They have also introduced certain measures to prevent the monitoring of these DNS servers. We will be discussing these measures in the ‘security’ section. The company comes under the Romanian jurisdiction. Romania is not among the 14-Eyes countries, and the local laws aid in the safekeeping of individual’s privacy. They don’t monitor any of the user’s activity inside the tunnel such as the websites visited and the data flow through the tunnel. But they do log some information, which we think is more than necessary. They claim to store this information for a day for security and statistics purpose. We are unable to understand that how will they keep the users secure by storing their personal information, even though it is only for a day. The collected information includes, the user’s original IP address, time stamps, session duration, and volume of traffic flow. The payment logs and the email addresses are also stored, but these are essential to provide services to the users. We think that they need to come up with ways so that they don’t need to store all of this personal information of the user while he/she uses the service. They have not installed any trackers on their website, and don’t use any analytics service on their website at all. We were pretty happy from this information until we came to know that they store the IP address of the visitors on the website. We wonder what is the benefit of not having any third-party trackers if they are going to store the user’s IP themselves. They need to realize that the users gravitate towards the VPN services because of the data retention by the ISPs and the websites they visit. Even if the data retention is for a day, it beats the purpose of the user having the particular service. 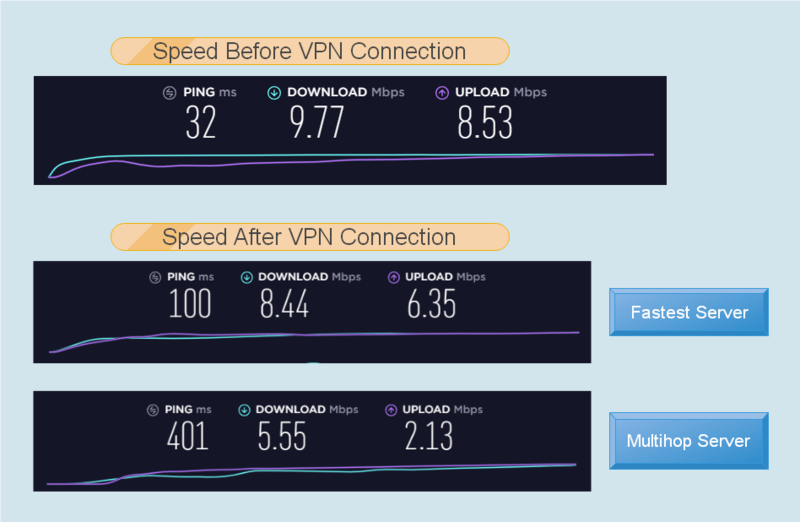 Just like different VPN services take vastly different times to connect to the network, in a similar way, the users also have different tolerance levels when it comes to waiting while the VPN client connects to the network. This particular section is dedicated to such intolerant users. We did the connection time analysis for the OpenVPN protocol as it is the preferred choice of majority of the users. The average connection time of just below six seconds indicates that the client is fast, but it is not the fastest one. We have come across VPN services with connection times of around 3 seconds. However, we won’t take away the credit form VPN.ac as they provide the user with a fast-enough client. 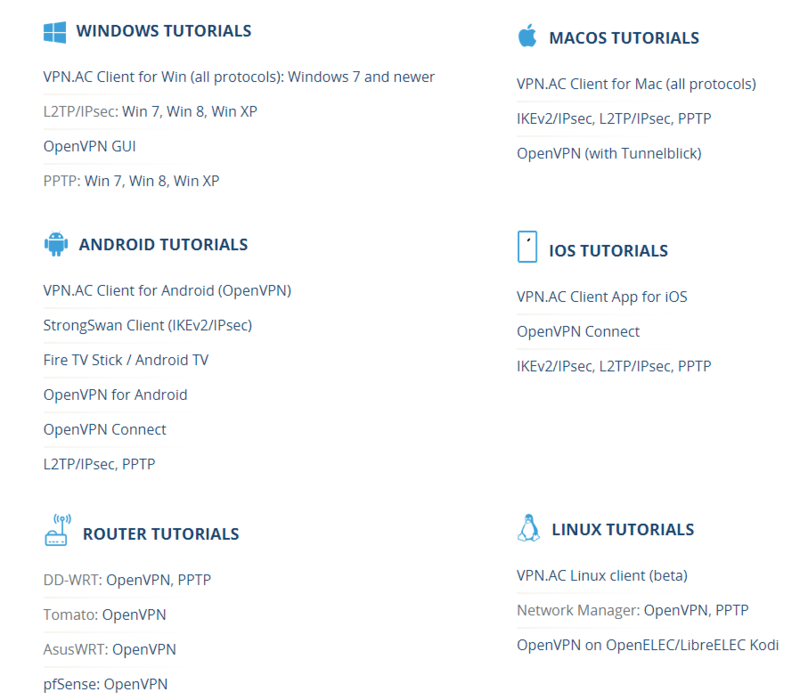 This is the section which has the top VPN products to the positions where they are at the present. Speed is a major concern for the users these days as they want to make the most out of their high-speed internet connection. There is no automatic server selection option on the client. So, we connected to the geographically closest server for our location. It was a pleasant surprise to see the retention of 86.38% of the original speed. This is considered fast in all the books of the VPN world. The case was similar for a lot of the other servers as well. The service was to able to provide high-speed internet consistently, and it was a smooth ride every time. The multihop servers also gave satisfactory results with speeds around 60% of the initial speed in most of the cases. There can be no complains when it comes to speeds on the service. Security is always a section for the VPN services where they get to flex and showcase over the top security measures available on the service. However, we are not very interested in seeing the big guns such as the encryption and the protocols, but those small factors such DNS leak protection, which can later prove to be Achilles heel. But it is not a proper review if the big guns are not taken into consideration. The user’s data is protected with AES 256-bit encryption. This is a military grade encryption, and the best one available. The users can rest assure that it is next to impossible for anyone to extract data from this sort of encryption. When it comes to protocols, the users have been provided with ample options. There are four protocols for the user to choose from, that is, OpenVPN, IPsec (IKEv2, L2TP), and PPTP. The OpenVPN protocol is generally the preferred protocol of most of the users, and we also agree with them. But if you want a bit faster internet speeds then you can go with L2TP protocol, which is the fastest protocol in the service according to the provider. The encryption and the protocols available on the service are comparable with most of the major VPN service providers, and they have gone a few steps further than some of the major VPN providers by allowing four different protocols on the network. The user does not need to worry about DNS leaks as well. They have their own DNS servers, and there is no third party involved which is always good news. They are not done with having private DNS serves only. To avoid the monitoring of the traffic of their DNS resolvers, they generate a lot of DNS queries at very high rates from the existing domains each day. These randomly generated queries are mixed with the queries of their users, and this makes it a lot harder to match the user’s DNS queries from the root servers to one from the DNS query sent from the private servers. There are not many VPN providers who put so much effort in such areas, and VPN.ac has got our respect and appreciation for taking the charge. However, the service does not support IPv6 at the time of the review, and we wish they did after such a strong overall security on the product. But they have provided a ‘Block IPv6’ switch on the client which mitigates the risk of an IP leak to quite an extent. Another security layer which is generally present on the VPN services these days is the internet kill switch. They have also provided an internet kill switch on the client. It stops all the internet traffic in case the VPN connection drops, and hence protects the user’s data from getting out on the internet without the safety of a VPN. The user interface of a service has the role of informing the user about all the functions of the service. A user interface should be such that the user is able to navigate through it intuitively without much help from the outside. The way in which all the options are catered to the users also makes a lot of difference. Too many tabs, and the user interface looks crowded and confusing. Just a few tabs, and the user feels that the service does not has much to offer. If the service is good enough, then it becomes very important that it has a well-balanced user interface which compliments the service. 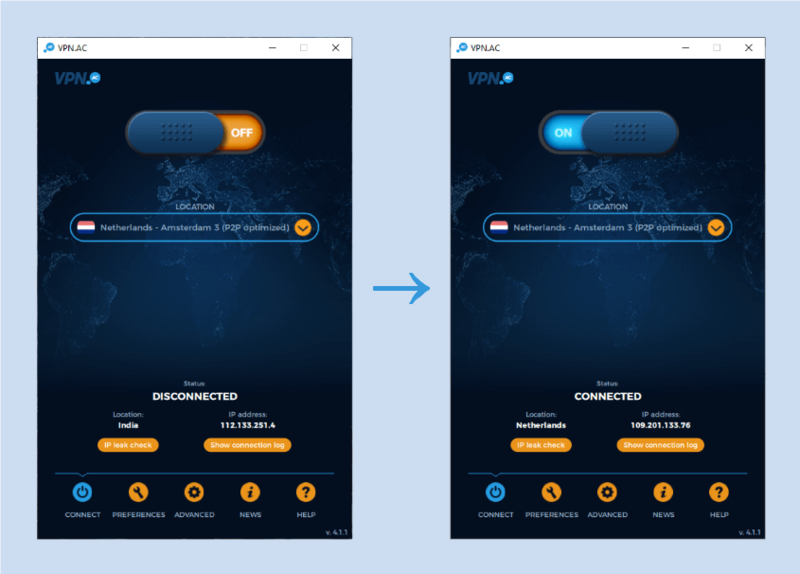 VPn.ac comes with a nice-looking user interface with day and night modes, and the users can have it their preferred way. The first window that the users comes across is the ‘Connect’ tab. It displays the current IP address of the user along with the server location and a connection switch. The servers are categorized based on the region only. As we discussed earlier, a more functional server sorting would have made the feature a lot more useful. The user can also have the protocols and ports displayed on this window if he/she wants. These kind of subtle customization options make the client very dynamic. The next window is called ‘Preferences’. The user enters the login credentials here, and then there are some customization options available along with the theme selection option. The next and the most useful window is ‘Advanced’. It presents the protocols and ports irrespective of the fact that the users have it on the first window or not. The window also contains the toggle switches for features such as the ‘Kill-switch’ and ‘Block IPv6’ option. The other two windows are ‘News’ and ‘Help’ respectively, and the names are self-explanatory. The VPN provider has got just the right kind of user interface for the product. It is not very complex, and the user can get going right from the start. The service is available on all the major platforms, which are Windows, MacOS, Android, iOS, Linux, and routers. The accessibility is broad enough as majority of the devices run on one of the above-mentioned platforms. But, it also minimal as there are a lot of other lesser known platforms as well, and all the devices which make use of the internet need a VPN cover. 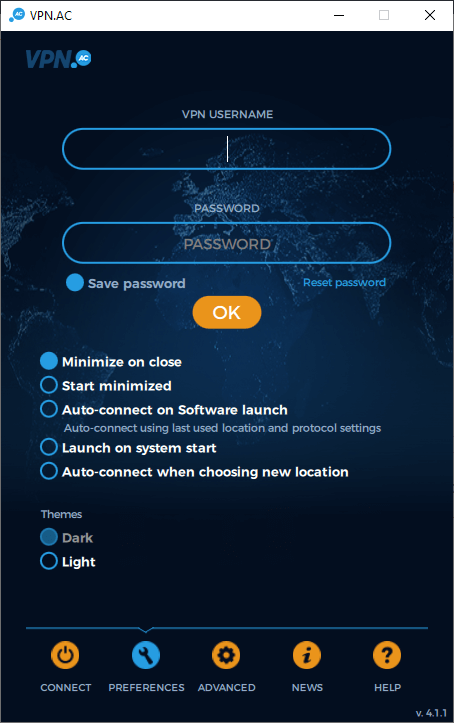 They have a provided installation guides for all the platforms on the official website, and if the user wants to use the VPN cover for other platform supports, then he/she should make use of the router. The service allows six simultaneous connections from one account, and this should be enough to suffice the needs of most of the users. When we found out that there is no live chat support for the service, we expected nothing but a slow and redundant customer support service as is the case with a lot of the VPN products. But, to our surprise, the customer support turned out to be a good one. It is not fast for sure as there is no live chat, and the ticket system always takes some time. The user may get a response within a few hours or maybe the next day. There customer support makes up for the wait by coming up with apt and relevant responses. We were quite impressed by the kind of responses. They have mentioned the users connect directly with the technicians, and we have no intent of contradicting their claim after the kind of responses we got. The FAQ page is also rich with information, and the user gets to know a lot about the features of the product through this support page. They have created an excellent customer support infrastructure, and we hardly missed the live chat feature while using their customer support system. The product performed much better than we expected it to. The speeds on the client when bundled up with the security measures available on the service, makes it an accomplished product. The multiple protocols, the optimized P2P servers, generation of random DNS queries from the server, the apt customer support, and a lot of the other things make the product so much better than a lot of its competitors. However, the battle is still not won for VPN.ac, and they can add a lot to their already satisfactory service. Inclusion of more protocols, dedicated servers, IPv6 support are some of the features which can enhance the functionality of the product. Other critical area on which they need to work on is to gain the user’s trust. They need to come up with ways to minimize the logging of data on the product. This is also not impossible for them because of the jurisdiction. It will make it easier for us to recommend this product to the users if the VPN provider can address these issues.